Doctor Who Day – Sat. Aug. 15! 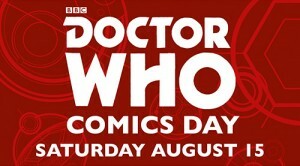 Doctor Who Comics Day is a global event inspired by Titan Comics’ Doctor Who comic books. Now in its second year, we’re pleased to say that the day will be even bigger and better than its premiere event, and we’re thrilled to be offering you the opportunity to celebrate with us. This year’s event will take place on Saturday August 15, 2015, to tie in with Titan’s Doctor Who summer event series – Doctor Who: Four Doctors! 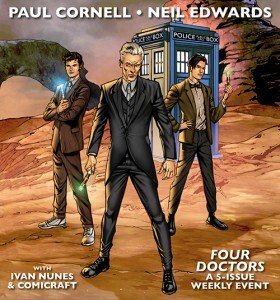 This spectacular 5-part weekly comics series will be penned by Paul Cornell and illustrated by Neil Edwards, and stars the Tenth, Eleventh and Twelfth Doctors and their comics companions! 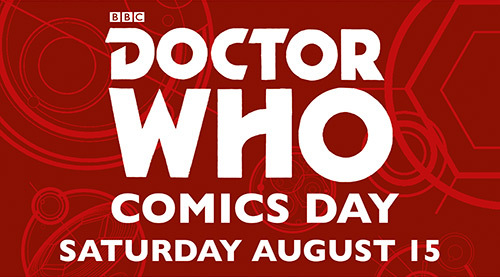 The first issue hits comic stores on Wednesday August 12, supported by Doctor Who Comics Day on Saturday August 15! Reserve your copy at your local NDC today! Want some other cool Doctor Who merchandise? Get 20% OFF all Doctor Who stuff ALL DAY! And… check out some of the sweet Doctor Who freebies while supplies last! ← FREE GRAPHIC NOVEL DAY! SEPT. 5TH!